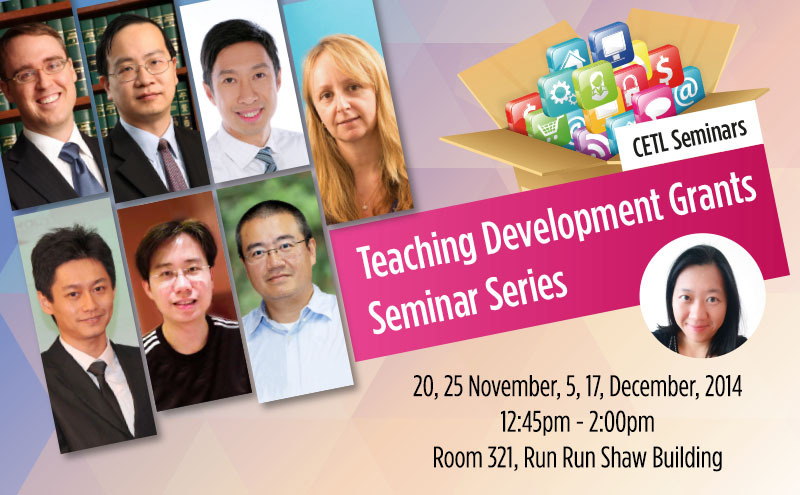 Due to unforeseen circumstances, we are sorry to inform you that Seminar 3 has been postponed to early next year. Apologies for any inconvenience caused. The Teaching and Learning Quality Committee (TLQC) invites submission of project proposals for funding support from the Teaching Development Grants (TDG). The TDG Scheme underlines the University’s commitment to furthering its mission in Teaching and Learning. The TDGs are intended to support projects and activities that will have an impact on the strategic development and promotion of T&L. Given the implementation of the reformed undergraduate curriculum in September 2012, the Committee will support initiatives beyond the exploration and development of the new 4-year undergraduate curriculum, in particular the systematic collection and analysis of direct evidence of the impact of the new curriculum and teaching on student learning. Applications should be submitted to Ms. Synthia Chau, Secretary, Teaching and Learning Quality Committee, c/o Academic Development and Quality Assurance Section, Registry. Enquiries may be directed to her or Ms. Julie Lau on 2219 4997. To facilitate TDG, a seminar series will be offered. This roundtable discussion is open to all teaching staff who are interested in finding out more about the Teaching Development Grants funded by the University. Staff will be provided an overview of the funding scheme, the allocation criteria, priority areas and advice in preparing the application. Teachers will have the opportunities to discuss their ideas and challenges with colleagues, and for those, who are looking for cross-discipline partners or guidance, you are strongly encouraged to attend. Staff who are not sure, or would simply like to know more about the grant, are most welcome. 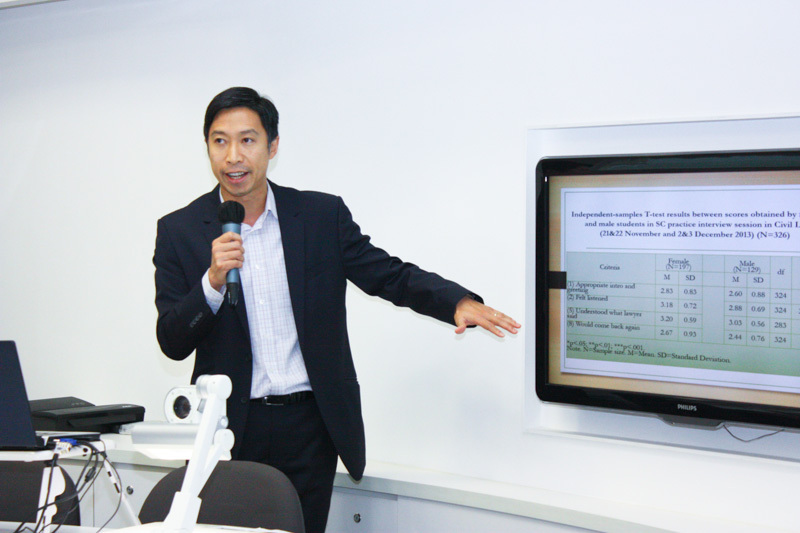 This Teaching Development Grant produced a 109-page academic report on the various plagiarism-related standards and penalties that 18 of HKU’s peer institutions have adopted. The institutions that were included in this academic study were Harvard University, Stanford University, Princeton University, Columbia University, the Massachusetts Institute of Technology (MIT), the University of California Berkeley, the University of California Los Angeles (UCLA), Cornell University, Boston University, the University of Cambridge, the University of Oxford, University College London, Imperial College London, the University of Edinburgh, the University of Melbourne, the University of Sydney, the University of New South Wales and the National University of Singapore. 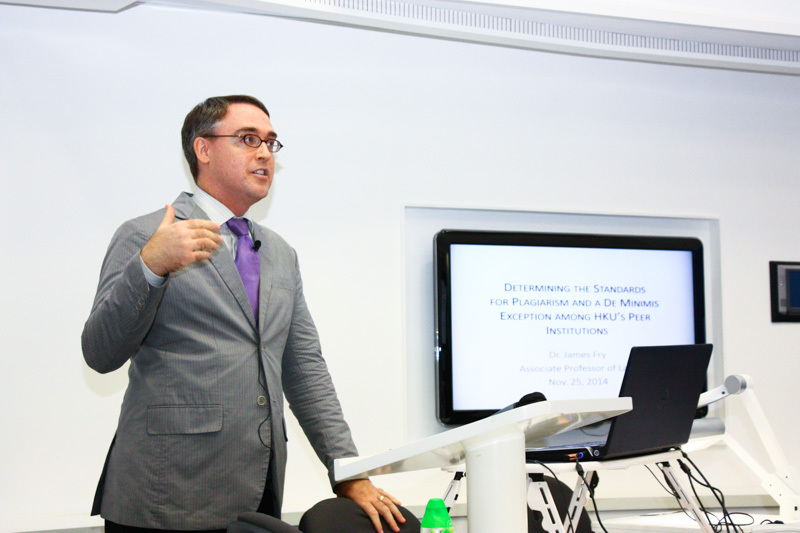 Dr James D. Fry joined the University of Hong Kong Faculty of Law in August 2008. He enjoys teaching and researching all aspects of law, in particular international law and comparative law, as well as legal education. Dr Fry is a member of the New York Bar and the Chartered Institute of Arbitrators, as well as the American Society of International Law, the European Society of International Law, the New York City Bar Association, the American Bar Association and the Swiss Arbitration Association. Dr Fry also is an accredited mediator with the Centre for Effective Dispute Resolution. This paper reports an empirical study of the use of simulated clients to teach and assess the interviewing skills and communicative competence of law students at the University of Hong Kong (HKU). In 2013-14, over 320 HKU Postgraduate Certificate in Laws (“PCLL”) students participated in interviewing exercises with simulated clients, who are lay persons trained to portray clients in a realistic manner by adopting the standardized clients training program initiated in Scotland since 2006. The paper will present the data analysis of assessment results of the students and their evaluation of this experiential learning program. While our analysis confirms the reliability and validity of using standardized clients as teachers and assessors of interviewing skills, it also reveals the necessity of modification of the original design of standardized client program according to specific cultural and commercial needs in an Asian business city like Hong Kong. 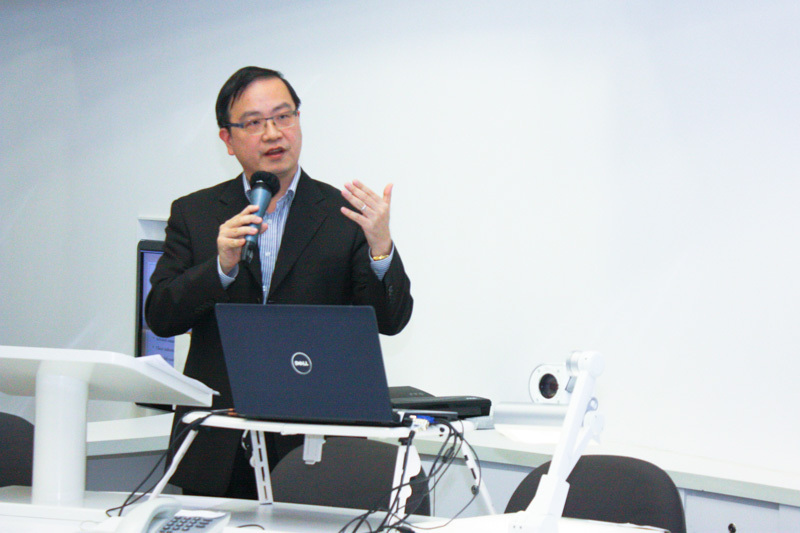 Wilson Wai-shun Chow, Associate Professor, is the first full-time local teacher in the HKU Department of Professional Legal Education. He was awarded funding under the HKU Teaching Exchange Fellowship Scheme and the Teaching Development Grant to develop, inter alia, the Standardized Clients project at HKU. 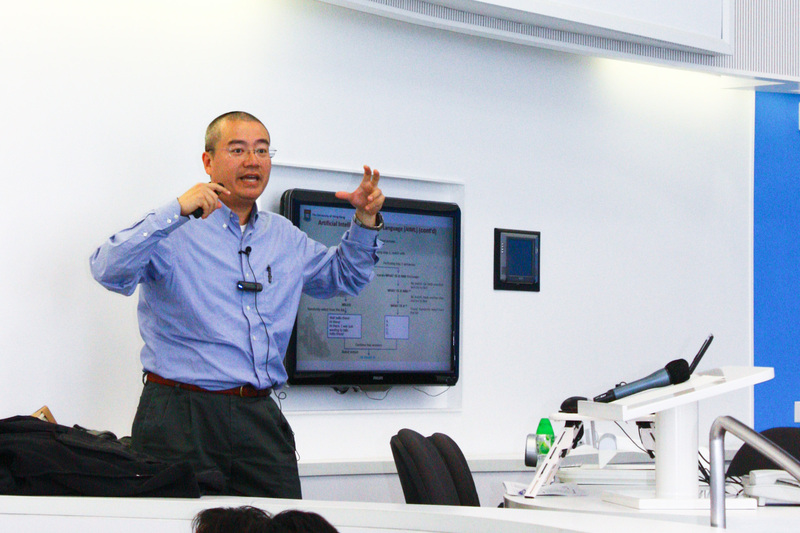 In recognition of his contribution to the curriculum reform and development in the HKU Postgraduate Certificate in Laws (PCLL) programme and effort in teaching and learning research, he has been given the Faculty Outstanding Teaching Award in 2012. 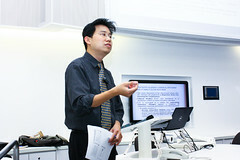 Dr Michael Ng joined the Faculty of Law as Assistant Professor in 2012. An active researcher in experiential legal education, Dr Ng’s works have been published in international edited volume and presented in international conferences. 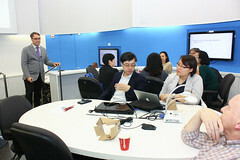 He is a core member in developing teaching and assessment tools for experiential legal education in the HKU Department of Professional Legal Education. Since 2012, the two speakers have been working closely in enhancing and enriching the learning experience of law students at HKU. They have co-presented at legal education conferences in the UK and the US and contributed to the scholarship of experiential learning in legal education. CAES1000 – Core University English course was offered for the first time in the 2012/13 academic year to 2,900 students. The course focuses on enhancing first-year students’ English language proficiency in the university context. 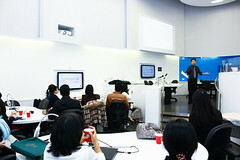 It aims to help students bridge the gap between secondary school study and study at an English-medium university. It is essential that any new course of this size go through a rigorous quality assurance review process in the first year of its implementation. 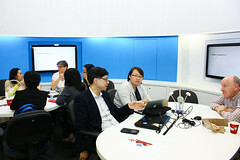 The purpose of this TDG project was to gather evaluative feedback from students and teachers on the CAES1000 learning outcomes, learning materials, assessments and the usefulness of the learning outcomes to students’ future studies at HKU, in order to identify areas for course improvement. Quantitative data were gathered in the form of evaluative questionnaires given to students and qualitative data were gathered from four rounds of focus group interviews with students and two rounds of anonymous teacher feedback questionnaires. The results showed that some changes needed to be made in the area of student and teacher workload, the way that the Moodle online learning system functioned and the integration of more writing practice and feedback to students. Results also showed that students valued the chance to improve their academic writing and speaking skills. Born in Melbourne, Australia, Ms Miranda Legg first completed a BA, majoring in Criminology and Philosophy. She then moved into the field of EFL and has since worked in Australia, England, Slovakia and Hong Kong as both a teacher and a manager. During her teaching career, she has gained experience in many areas of teaching, such as EAP, ESP and Computer Assisted Language Learning. She is now teaching a number of different English enhancement courses for undergraduates as well as coordinating the Core University English course. She teaches thesis writing skills to postgraduate students and co-teaches a core module on discourse analysis on the Centre’s MA in Applied Linguistics. Her main areas of interest are oral discourse analysis, Systemic Functional Linguistics, language assessment, Communication across the Curriculum and ESP and EAP course development. 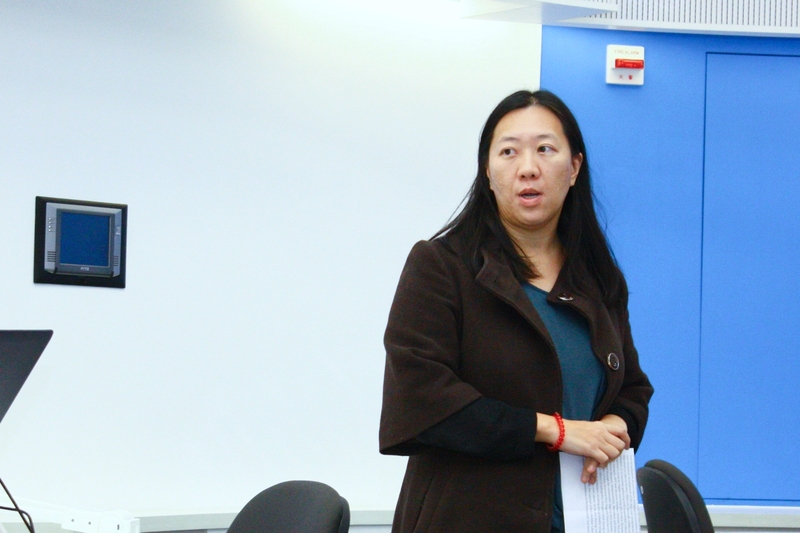 She is currently working on a PhD in the area of EAP curriculum design. Computer science and information technology are two fast evolving fields in the modern world. An undergraduate program in these fields must consist of two key components: (1) a training in the fundamental knowledge of the discipline and (2) a training in self-learning. The latter component is especially important for graduates to adapt to the ever-changing world of technology. 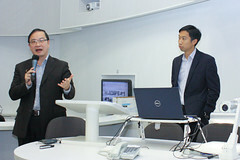 This project aims at studying the effect of applying the self-learning paradigm in teaching advanced technical courses in the computer science program. We identify the key differences between a self-learning lab-based method of teaching and the traditional classroom-based method. We study these differences through a controlled experiment in which we teach the same materials to two cohorts of students under the two different modes of study. We systematically collect and analyze student feedback, and compare and contrast student progress under the two teaching schemes. We also study how Moodle can be used to support self-learning courses. 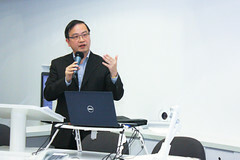 Dr Chun-kit Chui received his Ph.D. in Computer Science from the University of Hong Kong. 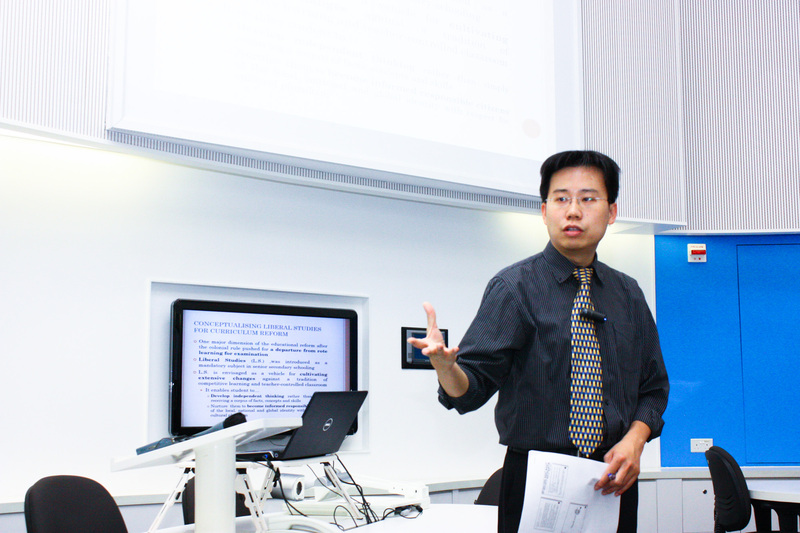 He was selected for the Faculty Outstanding Teaching Award (Individual Award) of the Faculty of Engineering in 2012-13. He has also received the Teaching Excellence Award in the Department of Computer Science in 2012-2013 and in 2011-2012, and the Best Tutor Award in 2007-2008, 2008-2009 and 2010-2011. The project created the space for a group of teacher educators from the Faculty of Education to build a community of trust for individual and collective conceptualization of core values, pedagogical principles, strategies in teaching and curriculum development of the four-year programme of Bachelor of Education in Liberal Studies (BEd-LS). Through collaboration, we completed a schedule of 13 monthly gathering with sustainable critical discussion over a progressive track for higher learning which were documented (with a package of the synopsis, PPT and the post-seminar review). For peer support, a 4Rs framework (Respect, Responsibility, Relevance and Relationship) has been developed through the sustainable inquiry over monthly reflections. Accordingly, a Value-Oriented Peer Support Exercise (VOPSE) is put into practice. A culture of collegiality was generated among our project members, and pedagogical innovative thinking was gradually integrated into practice with sensitivity to our core values, as we are sharing contextual understanding of our 4Rs framework. One journal article entitled ‘Liberated to learn: Teacher Education as Transformation of Relationships’ has been published. Dr. Dennis C.L. Fung is an Assistant Professor of Division of Mathematics and Science Education, Faculty of Education. His teaching areas include: Teaching of Integrated Science [EDUC7040] (PGDE FT/PT); Becoming a teaching profession: Education in a globalised society (I) (BEd&BSc); Classroom Research: An Introduction [EDUC2004] (BEd); and Teaching of Critical Thinking in General Studies [EDUC 7130 / EDUC 8130] (PGDE FT/PT). His research interests are: Liberal Studies / General Studies; Science Education; Group Work; Critical Thinking; and Educational Policy. The University-wide Academic Advising System was fully implemented across faculties in the 2012-13 academic year. Along with this, the University encourages web-based advising as an important tool in support of net-generation students who have lived their entire lives centered in digital technology. The Senate specifically recommended adopting technology for advising to complement traditional face-to-face advising. The objective of this project is the development of an interactive and multi-dimensional online academic advising tool in the form of a virtual student adviser. By using Artificial Intelligence (Natural Language Processing) software, the virtual student adviser enables students to seek academic information and begin to explore academic options through engaging digital and mobile platforms. The virtual student adviser, as known as Annie and available at annie.aao.hku.hk, offers around-the-clock dialogue for general academic issues and encourages students to consult advisers as necessary. This new automated advising system is linked through the AAO website and available as mobile applications. Professor Wai-kin Chan is a Professor of Department of Chemistry, Faculty of Science. He is also the Associate Dean (Student Affairs) of Faculty of Science. Currently he is also serving as the chairman of the Academic Advising Committee. His teaching areas include courses in materials science courses at both undergraduate and postgraduate level. 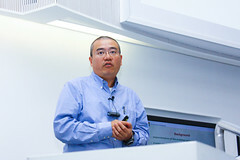 His research interests include design and synthesis of organic molecular and polymeric materials with interesting electronic and photonic properties; metal-containing polymers for photovoltaic applications; fabrication of organic opto-electronic devices by novel thin-film deposition methods; and synthesis of organic-inorganic nanocomposites. 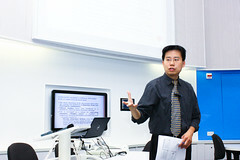 In 2004, he won the HKU Outstanding Young Researcher Award. Phone: 3917 8996; Email: laichun2@hku.hk.